Opening a trap door or window – possibly to open new windows or applications? 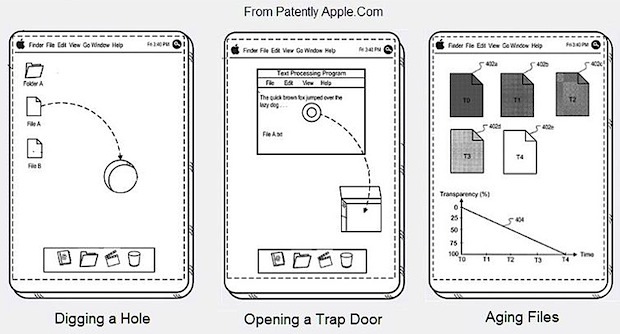 Typically Apple patents don’t indicate much more than Apple’s wildly creative side, but with how prominent gestures are in Mac OS X Lion and iOS 5, this particular patent shows a lot more real-world potential than usual. The other noteworthy side of the patent is the obvious touch-screen interface to something that looks more like Mac OS X than iOS, but you can read into that how you want. I should point out that some of the above potential explanations are my own guesses as to the gestures functionality, but you are encouraged to read the patent, look at the drawings, and arrive at your own conclusions. I think it’s safe to say that the future is gesture based. Wow I actually thought this was a joke–a parody. But, nope, it is real. Just when I thought I was all gestured out…. lol. I’ll keep my mouse, thanks. « iPhone 5 Announcement on September 7?